Good Night, and Good Luck. takes place during the early days of broadcast journalism in 1950’s America. 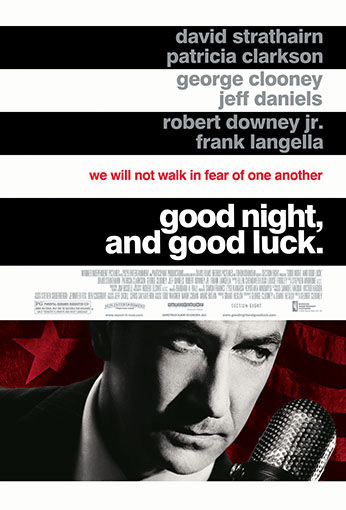 It chronicles the real-life conflict between television news man Edward R. Murrow (David Strathairn) and Senator Joseph McCarthy and the Permanent Sub-committee on Investigations (Government Operations Committee). With a desire to report the facts and enlighten the public, Murrow, and his dedicated staff – headed by his producer Fred Friendly (George Clooney) and Joe Wershba (Robert Downey Jr.) in the CBS newsroom – defy corporate and sponsorship pressures to examine the lies and scaremongering tactics perpetrated by McCarthy during his communist ‘witch-hunts.’ A very public feud develops when the Senator responds by accusing the anchor of being a communist. In this climate of fear and reprisal, the CBS crew carries on regardless and their tenacity eventually pays off when McCarthy is brought before the Senate and made powerless as his lies and bullying tactics are finally uncovered.